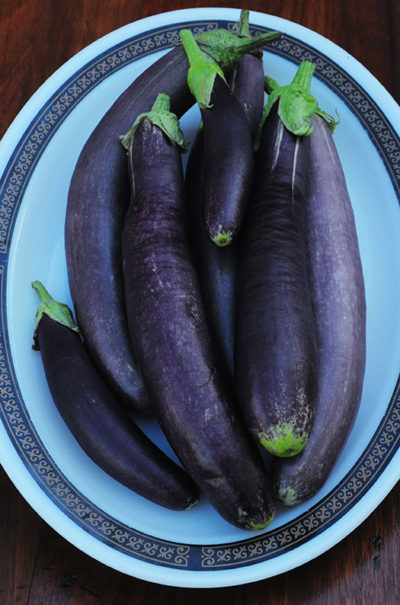 In an Asian stir fry or stuffed with ricotta and baked with marinara, eggplant is one of my favorite vegetables. Lightly brushed with olive oil and grilled, a slice of eggplant dresses up an Italian sausage sandwich. An eggplant pizza is always an excellent idea. 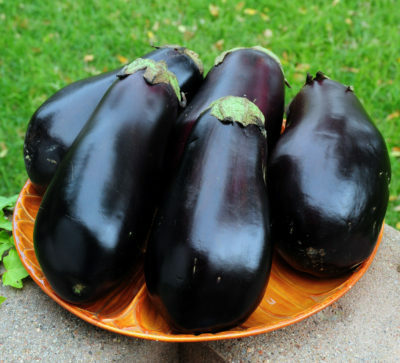 The “aubergine” intimidates some cooks, but it aids digestion, improves brain function, enhances heart health and helps manage diabetes. This glossy purple vegetable is worth the effort in any good sized garden. A warm season crop, native to India, eggplant seeds should be planted indoors 4 to 6 weeks before your last spring frost. Harden off seedlings by exposing them to the outside on warm, still days for a couple of hours at a time. Transplant when all danger of frost has passed, 18″ to 24″ apart in rows 30″ to 36″ apart. Row covers protect against temperature fluctuations and prevent some pest damage. Water deeply once a week, more if it is hot and dry. Eggplants will need structural support as the fruit gets quite large. Good companion crops are basil, beans, lettuce, peas and potatoes. Bad companion crops are tomatoes and corn.